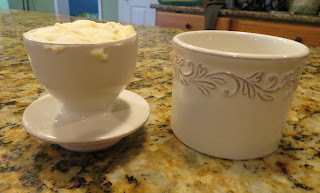 The Prudent Life: I Love My Butter Bell! I Love My Butter Bell! I wanted to share something I found that I just love. Once again, I am not getting compensated for this in any way. I simply want to let you know about this wonderful thing I found called a Butter Bell. One of the things that I just know isn't good for me is soft, spreadable margarine. However, I just wasn't quite ready to give it up. Real butter kept out of the fridge gets way too soft, but when it's kept in the fridge it is way too hard. And so I just kept buying my favorite Country Crock. I figured it can't be that bad for us, right? But I knew the truth: any kind of margarine is a fake, man-made concoction full of stuff that's not good for you. And then I made the wonderful discovery of the Butter Bell! This wonderful little crock is designed to hold a stick of butter and to keep it at the perfect, spreadable temperature. The only thing I have to do is add some cold, fresh water every couple of days. I love it! Now, spreadable margarine is no longer on my grocery list and I am instead feeding my family real butter. So glad I found this. I thought maybe someone else would be glad to know about this, too.